GPS Insight’s fleet management technology helps improve efficiency by ensuring trucks receive preventative maintenance on schedule, tracking fuel efficiency and examining the utilization of delivery trucks. 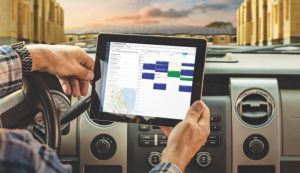 Whether it’s an ERP system or estimating software, a new point-of-sale solution or GPS tracking technology, there are plenty of options out there for dealers looking to improve their business through new technology. Using Building Information Modeling, MiTek’s Sapphire Supply is able to create more accurate estimates, improving efficiency and reducing waste. At the same time, that wealth of options can be overwhelming. Choosing any new software is an important decision. Having involvement from managers and other supervisors will not only help determine areas that need to be improved, but will help ensure employees are on board with the changes, says Jason Parchomchuk, Product Manager for BisTrack at Epicor. One of the most important steps when looking at making a change in software is being sure you know what you want out of the solution. Those key managers can help a company identify specific areas for improvement. Ranking those features and deciding how important they are can help make decisions down the road. “Write that down, and then have an order of importance … so, I need to know what my specific requirements are, prioritize and rank them in such a way that you can figure out, how do I point and score these things,” says Felix Vasquez, CEO of Hyphen Solutions. It’s also key to know about the technical capabilities of a potential partner. How often is the software updated? Can the company deliver on what they promise? Before investing in a new system, consider the track record of the provider, says Seljax Sales Manager Lloyd Sherwood. Epicor BisTrack helps dealers track and leverage their data to gain insights to increase sales, deliver exceptional customer service and increase profitability. Holden Melia, Executive Vice President of Sales and Marketing for DMSi, agrees, noting it’s important to know about the company’s support and track record with other dealers. Don’t just take a yes/no answer from a provider—ask to see how the features you want are going to work for your company, Melia says. ECi’s Spruce is cloud-based, giving users access to key reports and other information anywhere they have internet access. With any new platform, there’s going to be a learning curve, so dealers should look for a company that offers training and a good transition plan. The best companies are always improving their offerings and looking to separate their technology tools from the competition. 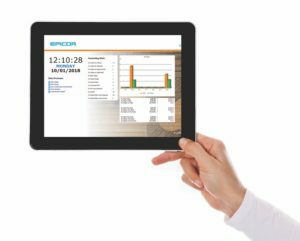 Epicor BisTrack is an ERP system built specifically for the building materials industry, with features designed to improve customer service, leverage data and simplify operations. Renditions, part of Hyphen Solution’s SupplyPro, makes it possible for suppliers to use SupplyPro as a single entry point for all their builders, instead of having to use multiple different portals. “It’s a whole suite of manufacturing, multi-branch customer retention management (CRM), web store, online portal, everything built into one package,” says Jason Parchomchuk, Product Manager for BisTrack at Epicor. BisTrack also includes cloud-based mobile apps as well, allowing users to give customers quotes on the jobsite, make changes on the fly and track deliveries wherever they are. The company recently released mobile apps for iOS devices, joining the existing Android offerings. “Everything you can do in the system you can also do while you’re on the jobsite,” Parchomchuk says. 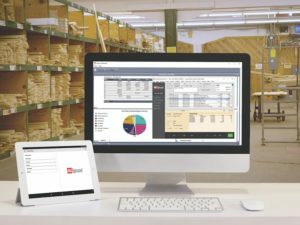 ECi’s Spruce software is a cloud- based, end-to-end management software for LBM dealers. It can help dealers with point of sale solutions, accounting, delivery and more. 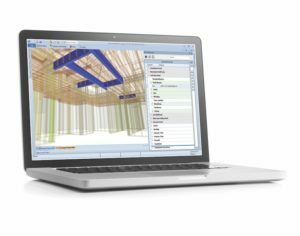 What sets Spruce apart from other software is the company’s depth of knowledge in the lumber and building materials industry, says John Maiuri, President of the LBM and Hardlines Group at ECi. ECi has worked hard to find experienced LBM professionals to help guide the product’s development. New to K8 is a mobile configurator that will allow users to access the system’s tools on the go. “The big difference in customers, now, is they’re looking for more mobile applications, and they’re looking for a lot more capabilities on the web,” Anderson says. DMSi’s Agility mobile app allows salespeople to manage their day, collect notes and take care of tasks on the go. 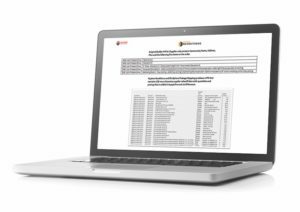 DMSi’s Agility ERP software is used by more than 400 companies in the building materials industry, according to the company. DMSi has recently added a mobile CRM application that allows salespeople to manage their day-to-day notes and tasks on the go. 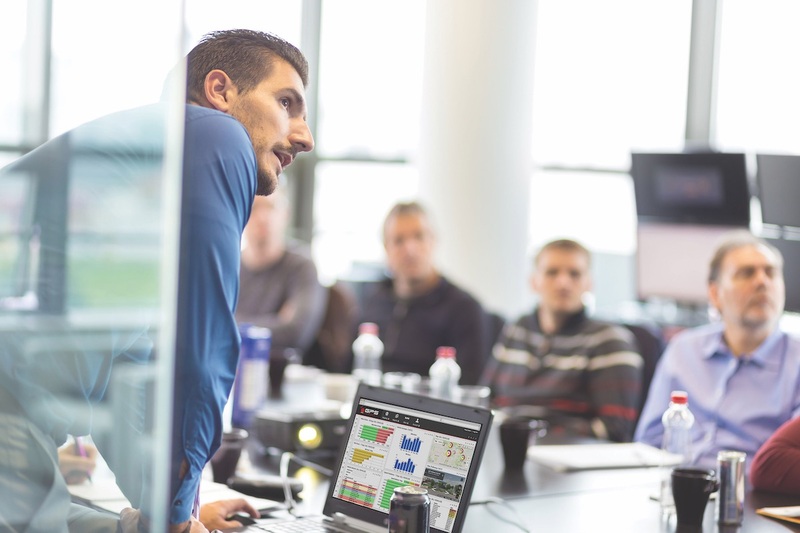 A new loyalty program for Agility also is designed to help drive repeat business for dealers. As employees and customers continue to embrace mobile technology, more technology companies are offering mobile solutions to meet everyday business needs. Main Street Companies created Mobile Visual Pro to help salespeople create takeoffs and estimates while working with contractors in the field. The difference between Mobile Visual Pro and other solutions is that instead of it being a live application that’s working through a server back into the dealer’s system, it’s an upload process where all the products and information are uploaded through the server and into the mobile device so that data is always residing on the mobile device. 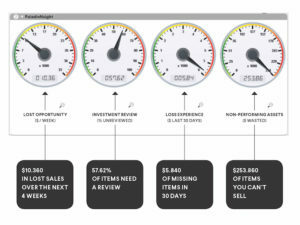 The information is regularly updated when the salesperson connects to the server. “And because of that, they’re able to do their work without any kind of interruption from cell service or lack of cell service,” Linn says. 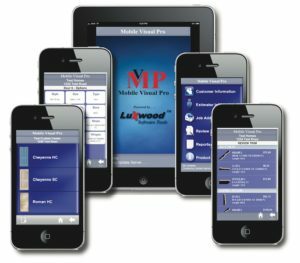 Mobile Visual Pro is a mobile software solution for on-site take-off and estimating. Designed for the field, it operates on an iPhone or iPad and provides point-of-sale integration with virtually any system. Mobile Visual Pro also increases accuracy by moving salespeople away from the traditional scratch pad and notes that they then would have to de- cipher and enter into the system when they returned to the office. Main Street originally developed the software for use at its own millwork business before expanding it to make it available for any dealer. MiTek’s Sapphire Supply is a solution for whole house designs and lumber estimates that works off of Building Information Modeling (BIM). This makes orders more accurate and improves efficiency across the board, while reducing waste. Hyphen Solutions offers SupplyPro, which makes it easier for dealers to communicate and manage orders from large builders. SkuSphere, part of the SupplyPro tools, works as a sort of “universal translator” to make it easy to move orders from builders to suppliers without creating confusing mistakes. Renditions, another part of the SupplyPro family, makes it possi- ble for suppliers to use SupplyPro as a single entry point for all their builders, instead of having to use multiple different portals. 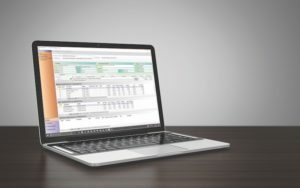 SaberisConnect offers another solution for dealers to improve their efficiency by integrating vendor order systems to their POS or ERP system. The program originally launched as a desktop solution in 2001, but is now cloud- based, offering integration to dealers for $99 a month per location. The company continues to integrate with more vendor systems as dealers ask for them. RenoWare is designed as an easy to learn app that automates and integrates the Installed Sales process from start to finish. It can be a single user, local network or cloud based database. This fall, Saberis is implementing what it calls “stealth integration,” designed to make the process easier and save even more time. The feature will be introduced with some vendors this year. Not every dealer has installed sales, but for those who do, RenoWare Technologies is trying to make managing that part of the business easier. Cleary 365 from Computer Associates, Inc., the first commercial implementation of Ponderosa Software’s web-based Sales Portal technology, lets customers create millwork quotes and place orders 24/7 from any mobile device. While many POS systems have modules that can be used for installed sales, Cutler says RenoWare is superior because it is designed for installed sales only and offers more reports and details. Many companies have no idea there is an installed sales solution out there and are making do with something that isn’t a great fit, Cutler says. Computer Associates’ Ponderosa Building Materials software is a full suite of applications based on 40 years of experience working with building material and millwork clients. 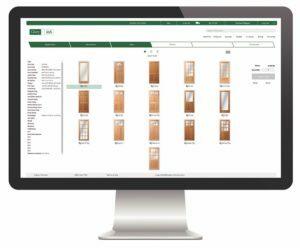 Ponderosa and Cleary Millwork recently announced Cleary 365, a configurable, online ordering system that provides 24/7 access to inventory, pricing, quotes ordering and credit information. Ponderosa Software has also introduced its Electronic Signature Capture feature that sends orders to drivers’ smartphones or tablets and allows them to capture signatures, add photos and make notes related to deliveries, installed sales and service work. Paladin Data Corporation has developed a digital retail platform, with the goal of automating time-consuming tasks, so retailers can focus on their customers. Paladin was designed and built for the hardware and LBM industries. Paladin is regularly introducing new proprietary features and third-party integrations with software providers, Rogers says, including Mobile2, which facilitates the use of mobile devices in lumberyards or by delivery drivers; Charity Roundup, which allows end- users the option to round up their purchase amount to the next dollar and donate the difference to charity and Rich Rewards, Paladin’s royalty-free customer loyalty program. GPS Insight offers a different—but no less important—technology tool with its fleet management system. tells you about your business. A fleet management system can improve communication, safety, efficiency and accountability, Shiner says. The GPS Insight system also integrates with many other programs. One roadblock to successfully implementing a software solution can be the reluctance of employees to embrace new technology. Providers say that one of the best ways to overcome this is to point to the ways the new software can make their jobs easier. Employees can be concerned about what new tools means for their future. Often, there is a reluctance to accept change, Linn says. “A lot of companies have been doing things the same way for so long and the guys in the field are used to just writing things up themselves the same way they always do,” he says. “And so we get pushback sometimes on that just because they’re afraid of it. Companies often worry about a disruptive conversion process. Seljax sales, estimating, and 3-D design tools are designed to increase speed, accuracy, and presentation of estimates. 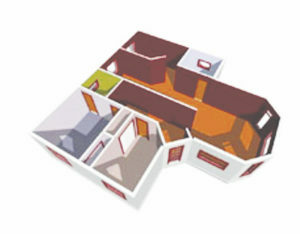 Platform options include 3D House, 3D Deck, 3D Stud Frame, and 3D Post Frame. Finding time to train employees and implement a new software system can be difficult, Maiuri says.